The modern digital designs in this book are thus ranged from register transfer level (RTL) to the lower end of SoC. The basic building blocks at RTL are: multiplexers, comparators, adder/subtracter, registers, and finite state machines (FSMs). Complex digital system may be built solely from these simple RTL components. 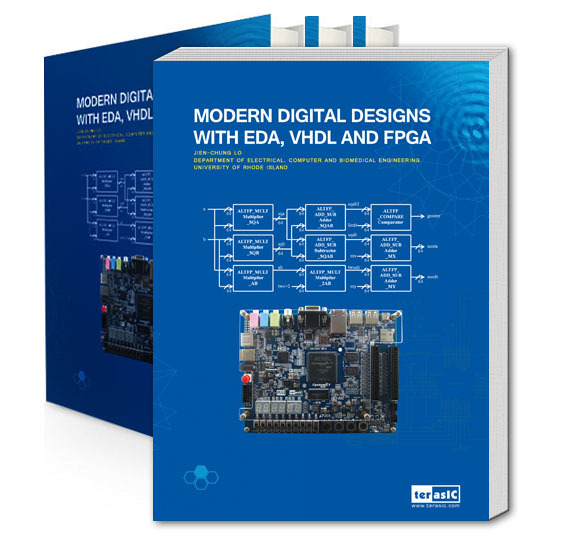 As will be seen in this book, in modern digital designs, even double precision floating point arithmetic circuits can be considered as a mere component to build a complex digital system. The name FSM refers to any sequential circuit that has well-defined finite number of states and actions associated with the states. Therefore, the behavior exhibited by a FSM is usually not in its hardware structure but in the arrangement of sequence of decision-makings and circuit actions. This is where the hardware meets software, since the FSM design has the feel of software programming. The difference is that in the FSM case, the “hardware” and “software” components are designed at the same time. Whereas the computer programming means that “hardware” is already given and “software” can only be developed with all the given constraints. The basic building block may go beyond RTL in the form of IP cores. Usually, standardize or proprietary interface is provided and the designers’ job is to make the core integrated into the system seamlessly. At this level, we are concerned about the interface electrical characteristics, timing issues and protocols. This book gives examples on PS/2, I2C, Altera’s Avalon Bus, and floating-point arithmetic circuits.